master. It is harder today than ever before, because there are so many demands on our time both at work and at home. Carpet Cleaners who don't manage their time will feel overwhelmed, tense, stressed and out of balance. They will work feverishly from one crisis to the next, never feeling like they are getting ahead, never able to bask in the satisfaction of a job well done. They are always working on the most urgent matter, rather than what might be the most important matter. There is no magic formula for getting control of time. It takes daily practice of discipline, focus and prioritising on what’s important. When I started in the Carpet Cleaning business, I noticed early on that most business owners didn't make good use of their time. I took careful notes and modeled my systems and methods of doing business after the few successful business people who seemed to always make maximum use of their time. 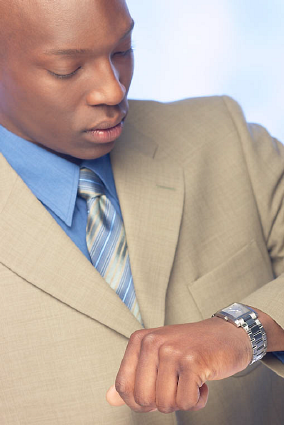 Here are some tip tips on good time management, you may find helpful. If you are not using a daily to-do list in your business, please start one. A to-do list involves more than keeping a few notes on a calendar. Although there are many different types of to-do lists, one of the best to-do list vehicles I have found is a simple pad. I list the projects that I have to do and get great satisfaction as I complete them and cross them out. At the beginning of the day or sometimes the preceding evening, I take a look at what I did yesterday and what I didn't accomplish and what I have to do for today. I don't write down specific appointments. I just write down everything I have to do and everyone I have to call. I assign a priority to every task and every call, numbering them one, two, three, four and so on. Then, I start with number one. That way I am always ensuring that the most important things are done first. It makes it far less likely that things will slip through the cracks. You should have only one to-do list going at a time. Be sure that you do not place too much on it. A two-page to-do list is entirely unrealistic. If your list becomes cumbersome, and you never seem to get through it in less than a few days, or you find yourself continually re-writing items, take a moment to review the proper usage of a to-do list. Remember that not all tasks are the same. After you write your list, put a priority number next to each item, and focus on the most important ones right away. By setting priorities, you will know at the end of the day whether you spent your time wisely. For example, if you got only two things accomplished, but they were the only two high-priority items on your list, you are entitled to feel that you had a good day. Projects not completed today can be carried over onto a new daily action list tomorrow. But don't make the mistake of using the same list again. Each day, you should make a new list, and rank the priorities again. Circumstances change. Yesterday's number five item may rank as a number ten item on today's daily action list. I cannot overemphasize the importance of making a daily list. It is hard to have a clear idea of what jobs you have to do until you write them down. By writing down a daily action list, you can see what is on your agenda and get a realistic idea of what you can accomplish in a day.